“Republicans might be forgiven some schadenfreude….” Living space? Like what Hitler wanted on his eastern flank? Nah, that’s all on the socialists in the Dem Party. Yes, he is the Master. He pulled the first loose thread that began unraveling all the advances in race relations America had struggled to achieve over the previous 150 years. But Barry Seotoro acted like a regular propagandist from Moscow. C’mon smart guy! Let’s have a look at all of those records you had sealed. And why is it so quiet in Ferguson these days? All problems solved or did they just go away when Bathouse Barry left office? And to think BLM never had to meet with president Trump even one time. Schadenfreude is Schadenfreude is the experience of pleasure, joy, or self-satisfaction that comes from learning of or witnessing the troubles, failures, or humiliation of another. It has nothing to do with socialism or nazis..
What we saw from Obama was that he ALWAYS put race first. Always. In that recent $MeOnly movement we saw where women always placed womanhood first. Always. Don't expect the Great Divider to heroically step in front of this train. Whoever gets run over gets run over. Too bad. It was his fault for being white. This is how Libs are. And I don't really think this is a "tragedy" for the Dems. Eventually they want to get rid of all white men anyway. I'm sure they all envision a time where every govt position is held by someone like AOC only maybe a bit more gay or transgender or something. Pretty soon even she's going to be "too mainstream" for the crazy Dems. Look at Pelosi. 10 years ago she was as extreme Left as they come. Now she's almost the voice of reason compared to AOC. This is the direction they're going – Hard Left. All these white soy boys in the Dem Party don't understand they're about to get sacrificed for the greater good of super-socialism. Why anyone white would align themselves with the Dems is beyond me. Why any men would align themselves with the Dems is beyond me. Why any supposed Christians would align themselves with the Dems is beyond me. Why anyone with any common sense at all would align themselves with the Dems is beyond me. You said it Dr G. ANYONE with common sense wouldn’t align with the left, but those who DO LACK COMMON SENSE..
Well said……….he pulled every thread he could find and did his best to unravel the entire nation. And don’t think for a moment they have stopped……him and “She Beast” are positioning themselves for another run at it. Aw, couldn’t happen to a more deserving entity. I am not apologizing for my lack of sympathy. Me neither. 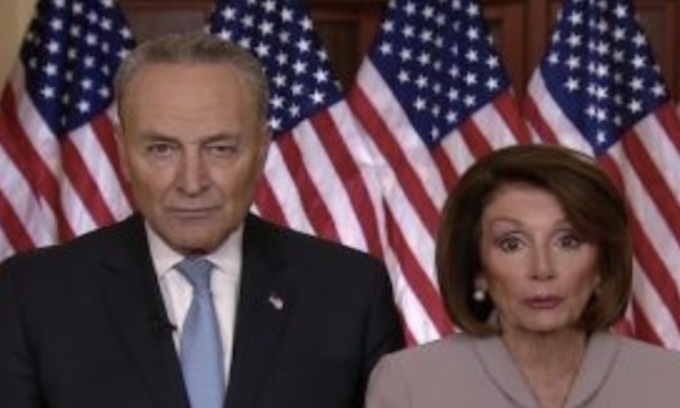 I am chuckling at how they are ‘eating’ one another, but would MUCH rather it be a full on death-bowl like cage match, every dem enters, only 1 gets to leave.. Than a proverbial ‘eating of each other’..
That picture of nancy and chuck should be used in every republican campaign, with the caption of, vote for the walking dead. We need more zombies in congress. I keep saying, in a zombie apocalypse, the DEMS are the only ones who have nothing to fear. Zombies eat brains, something DEMS LACK. So Zombies won’t be going after Dems!